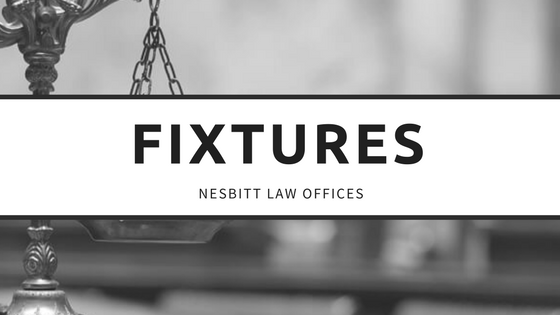 Fixtures - The Law Offices Of Eric L. Nesbitt, P.C. One of the most common questions that sellers of residential real estate ask concerns what they are allowed to take with them when they move. Often, people will decorate their houses with specific taste and want to transfer items to their next house. In Colorado and many other states, the default rule is that only “fixtures” stay with the house; other items go with the seller. As noted, this is only the default rule. Parties, can negotiate an agreement wherein the buyer agrees that the seller will take a fixture with him or her when he or she goes. Similarly, the buyer can negotiate that certain items that are not fixtures, called chattel, will remain after the sale. In its simplest form, any item that is attached to the real property is considered a fixture. This means that a brand new showerhead in a box inside the house is not a fixture. Once, however, the showerhead is attached in the shower, it becomes a fixture and is included in the sale of the property. Fixtures also include items that are too heavy to move with regularity and have a strong association with the property, even if they are not attached. A very heavy portable fireplace that is used to heat the house may be considered a fixture. A piano, though very heavy, would likely not be regarded as a fixture because its utility is less essential to the house than an item that warms the house. Moreover, detached items that are necessary for the use of fixtures can be considered a fixture. For instance, a remote control used for the heating system would likely be considered incidental to the heater and therefore constitute a fixture. Kitchen appliances and laundry room appliances are generally considered fixtures, even though they are not attached. Items like the refrigerator and range are fixtures. Often, it is difficult to determine whether an item is a fixture. As mentioned, the best is to negotiate the removal of that item in the sales contract. Absent that, courts will look at different circumstances when determining if an item is a fixture. Most courts will look at the party’s intent when determining if something is a fixture. However, even that criteria is not without complexity. If, for example, a developer purchases property for the purpose of tearing down the house and the government condemns the real property, does the condemnation include the fixtures? Or does the fact that the fixtures are still attached to the property override the buyer’s intent? Buying a house? Selling a house? You need an attorney who knows the law. For questions about real estate legal needs in Colorado, contact the Law Offices of Eric L. Nesbitt, P.C. at 303-741-2354 or Info@NesbittLawOffices.com.